Black is my favorite color on a smartphone. It looks elegant, it's understated and it works on all devices, regardless of price, design or size. Sadly, it's not always an option, as some manufacturers opt to offer more eye-popping colors instead. The OnePlus 3T, for instance, is among those smartphones that aren't available in black, being offered only in Gunmetal and Soft Gold. Both look really good if I'm honest, but for fans of black devices neither will suffice. At least until now, as a new partnership sees the release of a much-awaited black version. 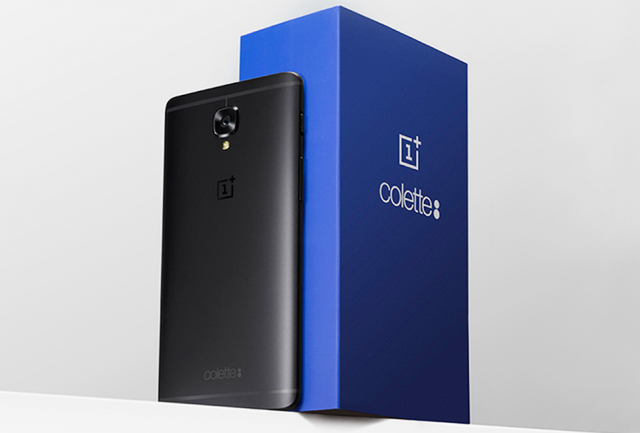 OnePlus has teamed up with Parisian retailer colette to offer an all-black OnePlus 3T. It's a special model, as there will only be 250 units available in total, all of which will feature colette's logo engraved on the back. The price of the OnePlus 3T colette edition, as it's officially referred as, is €479. And, honestly, that's a steal. For the money, not only are you getting a limited edition model, but you also get 128GB of storage -- a model OnePlus normally sells for €479 -- and a free pair of OnePlus Bullets headphones if you are among the "early birds." That's great value for money in my book. And the fact that it's a limited edition makes it a collectible for a die-hard OnePlus fan. Knowing the company, it's unlikely to offer it in black as a standard trim that anyone can buy. The release of the black OnePlus 3T marks colette's 20th anniversary, and the special edition will only be available to buy from the retailer's store starting March 21, at 11am. Other than it being a limited run, that's the only other bad news. But, hey, plane tickets to Paris tend to be cheaper this time of the year, if that's any consolation.